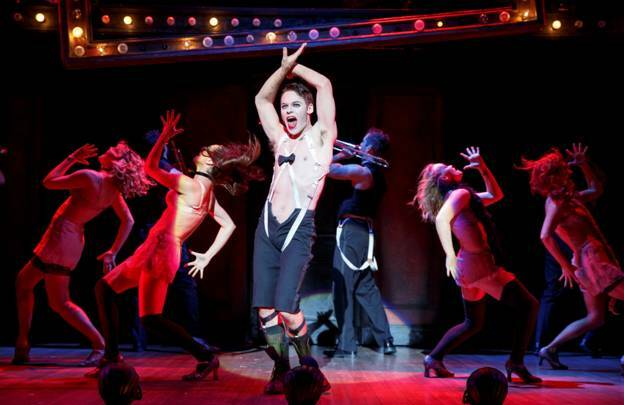 SAN FRANCISCO, CA – On press Opening Night, from the stage of the SHN Golden Gate Theatre, RANDY HARRISON, playing the part of the Emcee at the Kit Kat Klub, greets the audience singing: “Willkomen, bienvenue, welcome au Cabaret, meine Damen und Herren, Mesdames and Messieurs, Ladies and Gentlemen. Gutenaben, Bon Soir, Good evening. Leave your troubles outside. So life is disappointed? forget it. In here, life is beautiful. The girls are beautiful, even the orchestra is beautiful”. With the band playing the songs from “CABARET” blasting in our ears, and the lights on the large slanted frame hanging over the stage, flashing on our eyes, we get immersed in the decadent world of Berlin of 1929-l930, when hatred for the Jewish people was beginning to poison the hearts of the Germans. On the stage of the Kit Kat Klub, a man sings “If you could see her,” to a gorilla representing a Jewish girl. In the choreography of an ensemble dance, the dancers imitate the Goose steps of the marching Nazis. Outside on the street, a stone shatters the glass window of a Jewish man’s shop. On a sidewalk, a bleeding Jewish man was left to die. All around us, men are wearing red and white bands with black swastikas, around their upper arms and the Gestapo police is beating those who criticize the system. To this Berlin, and from Pennsylvania, (in this version) arrives American writer Clifford Bradshaw (LEE AARON ROSEN) with the purpose to finish writing his novel. He intends to support himself in the city, by teaching English. 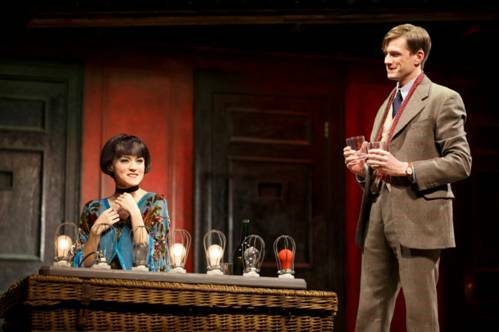 He rents a room in the boarding house, of Fräulein (Miss) Schneider, (SHANNON COCHRAN) a single middle age German lady and there, he meets Kit Kat’s singer and dancer Sally Bowles (ANDREA GOSS) who is also one of the girls that the Kit Kat’s customer can call from their phones on their tables. During his sharing a boarding house with this girl, Clifford learns a lot from her, even to define his sexuality. With book by JOE MASTEROFF music by JOHN KANDER, and lyrics by FRED EBB. 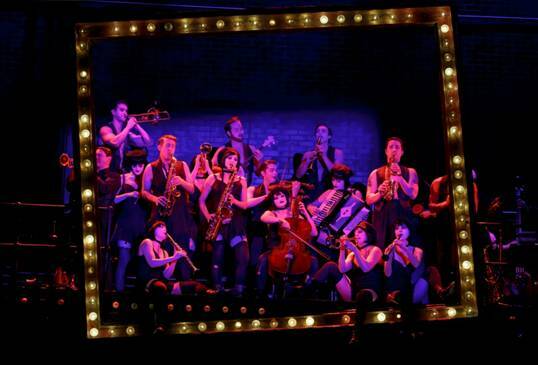 CABARET the musical relates an absorbing story transporting the audience, vicariously, from the inside of the Kit Kat KLUB, where everything is beautiful, to the outside of a changing Berlin where everything that is happening is ugly. This Roundabout, revival of CABARET (which opened on Broadway on March 19, 1998 and won four Tony Awards) under the gifted directorial team of SAM MENDES and ROB MARSHAL, present a different version of the previous CABARET. In this version, the drama is darker and stark in its judgement It is also more powerful. Some of its additions such as the projection of the Aushwitz camp at the end, a touch of genius. Other additions however, may be considered vulgar. One example is the choreography of the song “Two Ladies” presented as a shadow show. The he ensemble dancing is excellent, but dancers’ movements, are distasteful, even offensive to many. One of the best things in this show is the orchestra, directed by ROBERT COOKMAN. It is lively and plays with perfect rhythm, and pulsating sound. When it played the “Entry Acte” in Acto two, it got an extended ovation. Other good things are the lighting (PEGGY EISENHAUER & MIKE BALDASSARI) and the sound (KEITH CAGGIANO) While most costumes (WILLIAM IVEY LONG) in this show are appropriate for the characters, one has to wonder the reason why the Kit Kat’s Emcee (HARRISON) in this version, was dressed bare chested, with a black bow over his chest, his fly unzipped and white straps on both sides of his crotch going up to his shoulders, looking more like a clown than a man who runs a Klub. All the acting in CABARET was realistic, but the best impersonalization of their roles on that night, and their characters represented with more conviction, were given by SHANNON COCHRAN as Fräulein Schneider and MARK NELSON as Herr Shultz. 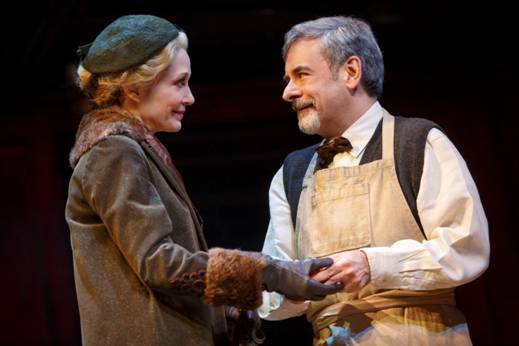 In their singing, demeanor and dialogue, the couple managed to make the audience feel their love for each other. Their story became real for us. We laughed with them, we danced with them and we cried their tears, as we ponder about how demeaning words of hatred, coming out of the mouth of a mad man, could manage to create so much hatred for a particular religion among the German people. Sadly, when this adorable couple was caught in this web of hatred, it destroyed their profound love for each other. nother good impersonation of his role, was ROSEN, who had the best singing tone of voice from all the singers on that night and played the role of American Clifford Bradshaw. The actor understood his character well. At the beginning, in her interactions with Sally, we see him hesitating, to her advances, simulating his insecurity with his own sexuality. After a while, in his demeanor, he is able to demonstrate his growing love for her convincingly. He shows us his happiness at the prospect of becoming a father. Each one of his emotions looked real. He remained in character, from the beginning to the end. As the Kit Kat’s Emcee, RANDI HARRISON, sang and danced well, but, at times, over-acted, and started playing his role with exaggeration. As Sally, ANDREA GOSS had great acting moments but did not seem to have grasped completely the identity of her character. so, her acting was uneven. She danced well and posses a well-tuned powerful voice, sang well all her songs, but her rendition of “Cabaret” her last song, that she sang standing at the center of the stage without moving, was bland. She needed more emotion. Analyzing this insightful version of CABARET, that shows us how hatred was the cause of Berlin’s decadence, we ponder on this question: What will we Americans do if ever a demagogue, (such as Hitler did) manages to poison our hearts with hatred for people of different religion and different races?